Using the Envelope Follower you can use the output of a Part for modulating selectable parameters of any other part. This way you can transfer the movement or rhythm of a Part to other Parts. This way of shaping the sound works especially well using percussive arpeggios or drum grooves. In the Controller Assign box you will find the sources named "Envelope Follower, 1 – 16, AD, Master". Translation: An Envelope is used to describe a shape. In synthesizers, we talk about three main components: Pitch (oscillator), Timbre (filter), and Loudness (amplitude). There are Pitch Envelopes, Filter Envelopes and Amplitude Envelopes. And what we mean by "shape" is, we need a way to describe how they behave over time. How they start, what they do while they are happening and how they disappear. In the case of this Envelope Follower we are using the Loudness (Amplitude Envelope) shape of one PART's sound to create an attack-decay-sustain-release shape for another Part to follow. Envelope Follower - the Source PART creates the envelope, the Destination PART follows that shape. We saw an example of how the Side Chain Compression uses one sound to replace or "duck" the volume of another, here the one sound will follow the shape of the other. A drum groove’s pulsing nature can cause the affected sound to follow exactly the rhythmic movement. You could take a phat synth bass and marry it to the shape of the kick drum pattern, so that whenever the kick drum occurred the synth bass sound would strike. In this example, a Synth Comping sound in PART 2 is used to influence a Synth Pad sound in PART 1. The Synth Comping sound is under control of an ARP, its pulsing techno groove triggers the Synth Pad to increase in volume. (Please note: The Live Set that is used in the Mastering MODX series is located here). This assignment is found in the MODX by editing the PART Controllers. Touch the “DISPLAY FILTER” box to open the LIST VIEW. Use the DATA WHEEL to scroll to "EnvFollow 2" (which means that PART 2 will be referenced as the SOURCE). In this example, the Dance pad is shaped by the rhythm of the synth arpeggio of Part 2. Temporarily reduce the Ratio to +0. This will remove the influence of Part 2 on Part 1 - you will hear the normal steady sound of the pad sound. As you increase the Ratio toward +63, you hear the increased influence of Part 2 on Part 1. In the screenshot above: PART 2 is selected. It is identified as the SOURCE; the bottom of the screen shows which Parts are feeding into the Envelope Follower as SOURCES to create the "envelope" and which are set to "follow". From this it is clear that Part 2 “SynCp”, is the source (arrow pointing up), and Part 1 “Pad” is the "follower" (arrow point down). You have GAIN, ATTACK and RELEASE - to help "shape" the envelope. Experiment by changing the Attack and Release to hear the effect on the results. Gain simply increases the audio output of the source energy. Important Note: It should be mentioned here that the screenshot above allows you to Edit the GAIN, ATTACK and RELEASE of the item that you have selected as the ENV FOLLOWER source. You do not *select* the SOURCE on this screen. The SOURCE is selected back on the PART CONTROL ASSIGN screen. When you change the "PART" on this screen, you are simply looking at (viewing) this PART's meter - its contribution to the mix. 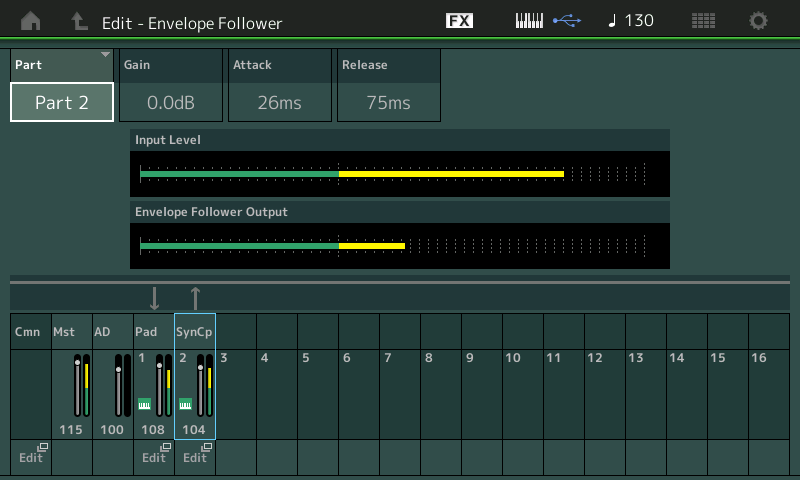 Above, we are looking at the INPUT LEVEL of PART 2, we are also looking at the Envelope Follower Output Level; Changing the GAIN, ATTACK and RELEASE of PART 2 will influence the sonic result. An important chance for changing the character of the modulation further, exist by using the filter envelope of Part 2 (Element 1). Especially the short filter decay (Decay1Time) is very important for the conciseness for the shape of the modulated Pad sound. If you increase the Decay Time the intensity rhythmic modulation will be reduced more and more. From the main PERFORMANCE (Home) screen. Select Part 2 to view PART 2 parameters. Touch "Elem1" on the bottom line of the screen to view Element 1 settings. You can see you are editing “Part2 - Element1”. Increase the value above 42; then decrease it again to hear what the Envelope Follower is doing. It allows you to shape the overall sound. Of course, the sound and/or device you choose to generate the source signal will have a great deal of influence of the result. Volume (amplitude) is a very typical use for the Envelope Follower, because we are using the loudness of the source to control the loudness of the target; but do not limit your thinking to the obvious or typical. This happens to be the best way to understand what this tool does, but be sure to use your imagination and do not be afraid to ask "I wonder what will happen..." This is part of the joy of synthesis. Try "Element Pan" instead of VOLUME as a destination for the Envelope Follower. Now instead of changing the volume of the target you can have that audio burst create a movement in position in the mix - get out your headphones as you can send sounds swirling off into the atmosphere. As we dive deeper you will have more of the MODX tools under your belt and with knowledge of what they can do, you will find an endless source of inspiration and things to try. Things do not all have to happen in a typical pulsating rhythmic way, you can create your own custom CONTROL motions over entire sections of music. You can offset the timing, extend when and where and how things occur. We can only open the door, let you peek down the long infinite hallway - it is for you to explore and create the music. Catch up on the previous article in the series - "Mastering MODX: Side Chain Modulation" here. Next article now available: "Mastering MODX: Motion Sequences” here.